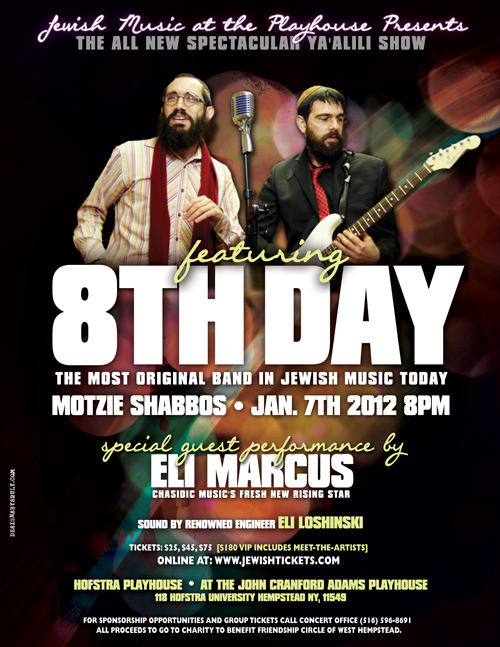 Jewish Music at the Playhouse Presents 8th Day with Special Guest Eli Marcus! Jewish Music at the Playhouse Presents the all new Spectacular Ya’alili Show! Featuring 8th Day, the most original band in Jewish music today. Special guest performance by Eli Marcus. Chasidic Music’s fresh new rising star. Sound by Eli Leshinski, at the John Cranford Adams Playhouse. All proceeds to go to charity to benefit Friendship Circle of West Hempstead.